Madiba, Sophitsho, Ngqolomsila, Yem-Yem, or as he is fondly known throughout the world, Nelson Mandela is truly the father of our nation! Born in Mvezo, Qunu, in the Eastern Cape – the then former Transkei homelands – 100 years ago was a young man who emerged from an “ordinary” upbringing to becoming the face of our country’s liberation and a beacon of hope to many others across the globe. Madiba is an iconic symbol of the struggle whose status throughout the globe reminds us that when we come together and strive for one common goal victory is certain! The 18th of July on the South African calendar has been set aside as a day where people spend approximately 67 Minutes in the service of others and the common good. #MandelaDay seeks to encourage all of us to step back from the daily schedules of our lives and offer a hand to those less fortunate. 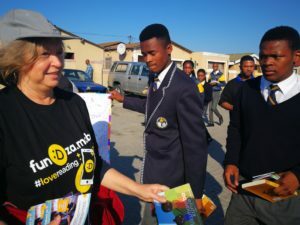 The FunDza Literacy Trust, with the amazing collaboration of community organisations in Khayelitsha, rolled up their sleeves and embarked on a “Literacy Fun Walk” with primary and high school pupils to promote reading and writing. 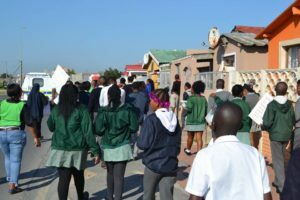 Wielding placards and chanting songs, participants distributed books to the locals while taking an exciting walk down Khayelitsha’s streets. The fun walk served as a reminder that in fact, young people are not disinterested to read, but rather, book scarcity in our communities is a sad reality. Mandela Day – what a wonderful day it was! 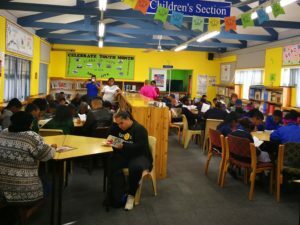 Thank you Madiba for affording us the opportunity to spread the love of Ubuntu and Reading for Pleasure to the Khayelitsha community in your memory! 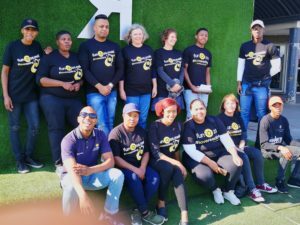 The FunDza Literacy Trust and Cover2Cover Books woke up early on Wednesday 18 July and headed out to Khayelitsha in partnership with Ikusasa Lelethu, Nali’Bali Trust and the Kulani Library to promote the love of reading to the community. We started with a very welcome cup of coffee at the Kulani Library with students from the Luhlaza High School. Sisonke Mengcane of Ikusasa Lelethu explained the purpose of the day to the students, offered a prayer of gratitude and gave the students 10 minutes to read in silence to set the tone. The local police escorted us and armed with pamphlets, banners and books we set off down the street, distributing our materials to everyone we came across. The walk was a happy one, with everyone singing and smiling. The sun was shining and it was such a joyful occasion. People in taxis, on buses, outside their homes and walking in the street all received a book or pamphlet, with some parents asking for more as they had more than one child. We stopped at an Educare centre where Sisonke explained the importance of instilling the love of reading to a child. One of the students offered to read to babies still in nappies who were sitting on the ground under a tree. What a great expressive storyteller she was. She had these little babies enthralled and you could see that they were really listening, nodding their heads and pointing to the sky – it was just amazing to see – babies so small not more than two or three – taking in her every word. We then proceeded to the Luhlaza High School during their break where we distributed more materials. This was done by playing a game in the courtyard and then having a competition to see who could deliver handfuls of materials to the students the fastest. It was great. The morning ended with a lunch at Randz. Chicken, chops and sausage together with their famous chakalaka sauce, spinach and pap were devoured. After all the walking everyone was starving and it was delicious! Thanks to all the organisers of the event and to our teams for ensuring such a successful day. Hopefully, we will be able to repeat it next year! On Mandela day, 18 July 2018, I was part of the FunDza team that was donating books and pamphlets to the residents of Khayelitsha. Other organisations namely, Ikusasa Lethu, Nal’ibali, and Khulani Library also took part. After a short prayer and 10 minutes of silent reading at Khulani Library we happily took pictures in front of the library. And thanks to the Lingelethu police we had fun as we safely walked joyfully on the streets of Khayelitsha. In one of the ECDs, a learner from Luhlaza high school volunteered to read a story for children. I was impressed at how she kept them up for that much period of time – the story was a bit long for the kids not to get bored. We were positively received by Luhlaza high school learners when we donated there. And some wanted to know more about FunDza and the writing competition. Everything went without glitches. I had a lot of fun during the fun walk and plenty of meat in my stomach at Rands. As one of the organisers of the event, I felt quite honoured to have been part of the organising team. From the day of the initial meeting, to promoting the event on Bush Radio and to the final walk – the event was so heart-warming for me. On the day I was filled with such high emotions and pride to be part and parcel of this prestigious event in honour of one of Africa’s greatest heroes. The collaboration from all parties involved was so overwhelming. Off course the biggest heroes of the day was the school children as we all know Dr Nelson Mandela adored children whole heartedly. 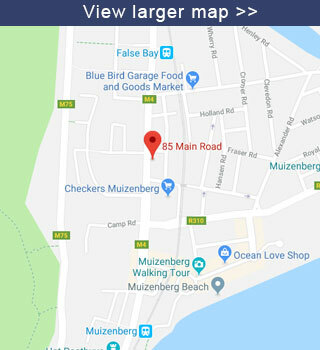 The joy I felt walking down the streets of Khayelitsha without fear of being harmed or hurt in any way was indeed the dream of our greatest hero and that was achieved in the most amazing of ways. The engagement with the community as a whole, police officers, traffic cops, school teachers, various NGO’s, Libraries and taxi drivers was indeed for me the highlight of the day. It is in events such as the fun walk that we realise there is hope for a better future. This boils down to the very reason why I LOVE my job. I looked forward to the walk because I value making contact with people. My highlight of the day was when I witnessed a high school learner reading a story ukuhamba kunye to educare kids. I love how she managed to captivate their little minds throughout even though it is proven that the little minds of children focus on short span of time. I also loved the enthusiasm that was shown by the young people we were walking with to march. They sang jubilantly and were very excited and enjoyed handing out Pamphlets to the passer-by’s. It is also interesting how we started the day with prayer and also 10 minutes of silent reading. Today’s experience evoked the thought that Literacy has a huge role in enlightening our nation. And answers to this life comes from opening a book. Opening a book then needs commitment from us as individuals. The stereotypes such as if you need to hide something from a black person, hide it in a book should come to an end. The excitement in the air was amazing. When we started the march and hearing the kids sing was really awesome. Even though I didn’t understand what was being sung, just the vibe we have with our own “african genre” is enough to make you dance.During the march I gave one of our rights booklets to a lady who was waiting on the bus and she thank me and said she is on her way to town and now she has something to read. She was really happy that it was something educational. We then went to a creche and got to read to 5 small learners and it was so nice to expose them to books and story telling and they were so captivated by the story and the young high school girl who read it to them so beautifully. After the march we had lunch with our colleagues at Rands and it was really nice to get to bond with my colleagues on a personal level over a great plate of food. It is always inspiring to get out of the office and meet first hand some of the people we spend so much time thinking about – the potential FunDza readers and writers. And it is also inspiring to work alongside others who are as passionate about getting South Africa reading as we are! So meeting the Kulani librarians, the Nalibali team, and the Ikusasa lelethu team that does tutoring was also a highlight for me. 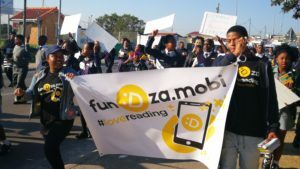 There was something very special about a march that was about giving things to people, and it was lovely to see the faces of small children getting books put in their hands – as well as rather bemused taxi drivers who received some of the FunDza material as they waited for the march to pass! And of course the other benefits of this kind of outing is that you get to know your colleagues in a different way as you wait for the march to happen – or when you go out to lunch afterwards! So now I know that two of my colleagues have the totem of a buffalo – one Xhosa, one Sotho – and I also have a colleague from royal Xhosa lineage. And I learnt some other stuff that I’m not going to put into this blog…! The Nelson Mandela Day fun walk for me was a true example of the saying ‘small keys open big locks.’ The smiles on those children as we handed them books reminded me how far a small act of kindness can go. As we went past Khayelitsha Special School, I overheard one disabled pupil shouting from the top of his voice, “Are you guys going to come back to us?” and I felt my heart sinking deep in water. He was shouting behind a big fence that limited his movement. I found myself asking how many people, like him, are reaching for our help but social boundaries barre them and thus limit their movements. As I looked at the eyes of that boy, Tata’s words echoed in my head “Disabled children are equally entitled to an exciting and brilliant future”. The walk was a definite good initiative but there remains a need for us to do more to help those who’re underprivileged. We shouldn’t have to wait 365 days to do something good for others; every day must be a Mandela day! At the end of the day it’s not about what we would do if we had everything; it’s about what do we do with the little that we’ve got!